includes free overflow drain kit! The AutoFlush is a self-cleaning device designed specifically for the Desert Spring furnace humidifier. It complements the Desert Spring Furnace Humidifier by creating a FULLY AUTOMATED humidification system. The AutoFlush is recommended for homes with hard water as well as those who want to further minimize maintenance. The Desert Spring Humidifier AutoFlush System removes minerals from the humidifier by flushing the reservoir at user defined intervals between once per hour and once per week. The Auto Flush valve remains open for a user defined duration between one minute and two hours, sweeping away unwanted mineral deposits and eliminating the possibility of stagnant water accumulation which could create an environment for mold or bacteria growth. Why add the AutoFlush to your humidification system? Let's face it, we all have the best intentions to maintain all of the products we buy to ensure that they operate at peak efficiency. However, in reality, our busy lives cause us to forget to do these important jobs, or postpone them for another day. Unfortunately, "tomorrow" never comes, and the maintenance goes undone. The AutoFlush system automates the process of regular maintenance, so you don't have to worry about it. Drain durationg: User defined between one minute and 2 hours. Includes all installation hardware (discharge hose, batteries, & mounting hardware) and a free overflow/drain kit! 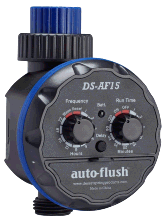 The AutoFlush is guaranteed for one year from the date of original purchase against defects in workmanship or materials. During the guarantee period we will replace a defective product if the product is returned prepaid to us. Please contact us in advance for details. This guarantee does not apply if the damage occurs because of accident, improper handling or operation abuse/misuse, unauthorized repairs made or attempted, or use of this product in commercial service.